Also Recommended: Bunny Drop, Daily Lives of High School Boys, Alice and Zoroku. Notes: Based on the manga series written and illustrated by Masao Ōtake, serialized in Kadokawa's magazine Harta, formerly known as Fellows! Yoshifumi Nitta is a young man who belongs to a Yakuza organisation referred to as the "Ashikawa-gumi". 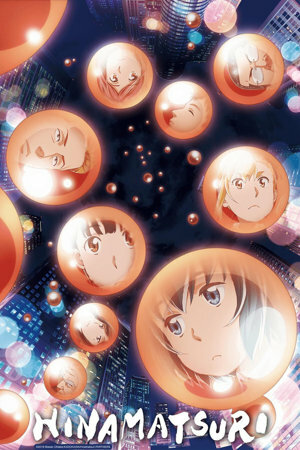 He's already somewhat well-to-do in their organisation, but his life takes a turn for both the netter and worse once a mysterious girl with strange powers literally drops into his life. 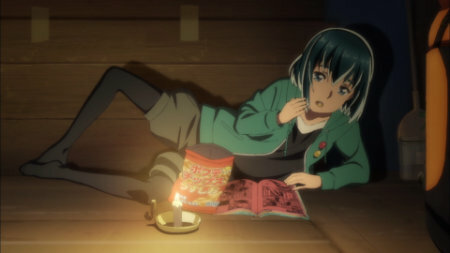 Hina herself is on the run from an organisation that wants her back, and chooses to resolve her situation by blackmailing Nitta into letting her stay under threat of destroying all his stuff. When I first read about this show in the season rundown, I sort of expected something more along the lines of Usagi Drop. This isn't entirely incorrect from a story perspective, but the tone of the two shows are fairly different, to put it mildly. 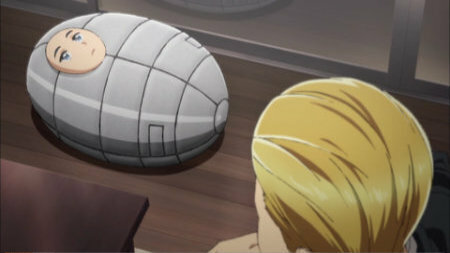 For one thing, Hinamatsuri is far, far, FAR more comedic in nature. 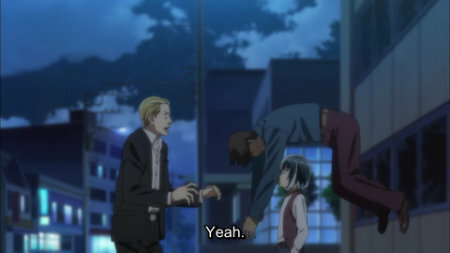 Secondly, where Usagi Drop was more about bringing out those sweet feelings of parental feelings, Hinamatsuri is almost relentlessly comedic in nature. The comedy lies a bit in the fact that Hina is a bit of an oddity. Her powers are no joke, but her mental state is sort of up in the air. She doesn't understand human behavior one bit, and tends to take anything she sees on TV at face value. She isn't really a malicious person, but she's remarkably clueless about what it means to be a decent person from a human perspective, and she seems a bit uninterested in bettering herself unless she stands to lose something from not doing so. Of course, her upbringing so far -- or, to be more accurate, her complete lack of -- are hinted at quite a few times at the beginning of the show. She was "made" so other people would benefit from it, both financially and from a perspective of power. Nitta, on the other hand, is probably the (arguably) "best" person among the main cast, at least among the adults. He's a part of a yakuza group, yes, but if given a choice, he'd rather keep his reputation and his work on the straight and narrow. That said, he's still a somewhat superficial person, and while you can to some extent sympathize with having to deal with Hina being a mooch, it's still not easy to see him throw her out on the street. It doesn't last, of course, but it still sort of happens. He's also a bit of a womanizer, though as far as I can tell from this show, the women he's spending time with in this show are fully aware that he's just doing it for fun, and doesn't mind getting a piece of that pie while they can. Sure, it's shallow, and sort of works as a presentation of what Nitta's life might've been like before Hina landed into it. In fact, that seems to be more of a general theme in this show. The people in the Yakuza clan Nitta works for seems a bit more merciless than Nitta himself, and isn't above putting people in cement-filled barrel during their random power struggles. In addition, Nitta himself is attracted to Utako Sakura, a bartender working in a bar Nitta likes to visit. Sakura is... an interesting character, to say the least. She seems decent enough from the get-go, but during the show, she basically blackmails a high school girl into being a bartender (though, in fairness, she also pays her for her work), and later forces said girl into moving into an apartment she couldn't possibly be able to afford.... except she sort of ends up being able to anyway. As an aside, she seems very entertained by said high school girl's discomfort when being pushed into a situation she never wanted in the first place. In her spare time, she runs a soup stand for the homeless, and protests on their behalf when the government wants to chase them away from the park they're living in. The woman is like personified mockery of the gray area on the morality scales since everything she does is her paying all her attention to either the angel on her shoulder or the devil. Subsequently, Nitta eventually wonders why he even found himself attracted to her in the first place. Of course, most of the characterisations in the show comes from the fact that it is surprisingly on the ball when it comes to black...ish comedy, its main dish being to point out the sheer absurdity of every single situation everyone finds themselves in when high-powered girls are thrown into the equation. And inbetween all this grey and gray morality, there's the homeless. 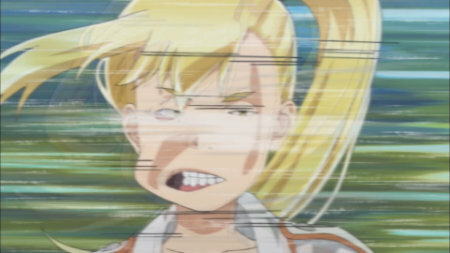 Anzu is the second young girl with mysterious power to enter the scene. Originally sent to bring Hina back with her, she somehow ends up unable to go back home, and by that extent, homeless. 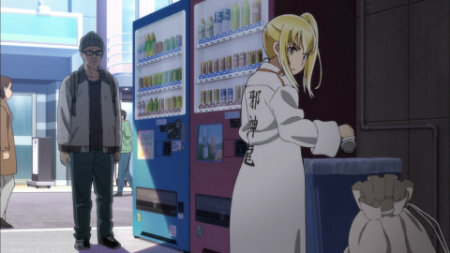 Eventually, she ends up under the care of Hassan, one of the representatives of the homeless community in Japan, and this is where Hinamatsuri turns its story and characterisation painfully straight to an almost politically charged level. Turning to a life of small-time theft just to survive, she is eventually taken in by Hassan, one of the homeless people in question. Hassan provides her with the lessons she need to turn over a more honest living, and in turn, she becomes a part of their little community. And while some of them seem a bit harsh on the surface, all of them are fully aware that their life is not one to be envied or emulated, least of all by a child like Anzu. 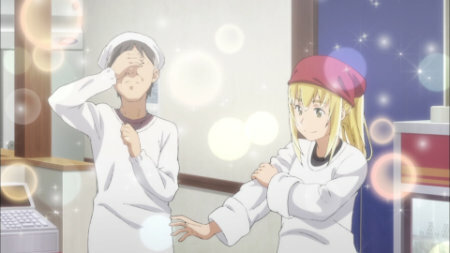 Eventually, she is adopted by an elderly couple running a restaurant -- in no small part thanks to the homeless people she was living with, after they are run out of the park they used as a home base -- and the two are constantly surprised by Anzu's reactions to everything, a lot of them being enough to bring them to tears. As the old song goes: "The kids are alright", though. Hina aside, most of the kids in the show are acting like you would expect kids to, though without the darker sides of adolescents. None of the kids bully each other, and many of their weird hangups are treated with a weird sense of respect. Hitomi Mishima, the girl who was blackmailed into being a bartender -- which is just the start of her many problems -- is the kind of idealized "nice child" concept that is portrayed as a parents dream, yet the show wastes no time playing up the kind of ridiculousness her naivete and trustworthiness can get herself into when exploited by.... lesser men, or... well, women in this case. It's that helpful busybodiness that lands her in a position to be exploited by Sakura, and her complete inability to let people down in any way eventually leads her into some pretty crazy situations, most of which comes from her attempts at getting out of it all backfiring on her in the worst ways. It can be pretty funny, mostly because Hinamatsuri's comedic bone is surprisingly well thought-out and never truly malicious. But if your level in Social Justice Warrior is fairly high like it is with me, it can also be very hard to see how her life is rapidly spiraling out of control thanks to other people's selfishness. 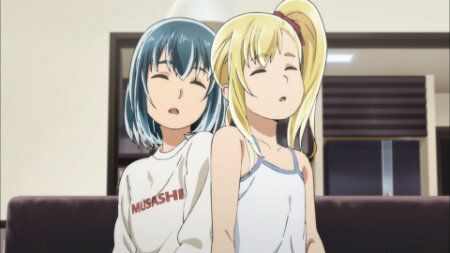 It's an awkward position to be in, and you're going to have to keep this in mind if you want to watch Hinamatsuri. On the other hand, there is an episode half centered around a TV reporter interviewing Nitta for a piece on the Yakuza, where said reporter had already made up his mind on what kind of person he is, and the resulting documentary that is played on TV is as wrong as it is hilarious. 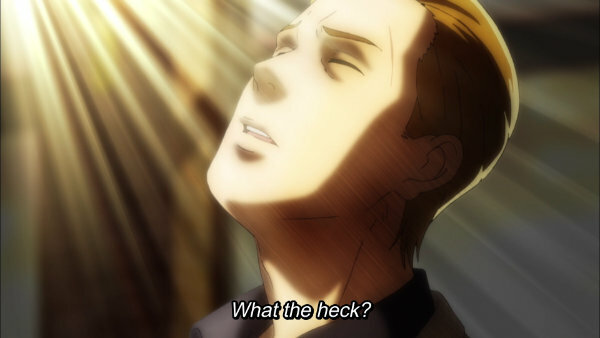 And for some reason, Hinamatsuri makes it work; the almost depressingly straight portrayal of Anzu's situation along with all the other homeless people when coupled up with the sheer absurdity of the more straight-man/girl characters of Nitta and Hitomi (respectively) and their varied reactions to the absurdity they're more often than not caught up in, whether caused by high-powered girls or not. The many variations of "What the hell is going on?" becomes sort of a mantra, often worn with shadow-eyed expressions of "I don't want to do this anymore" and the likes. Recommended Audience: The violence in this show is weirdly harmless. 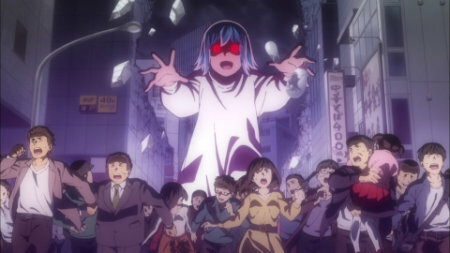 It's actually a part of the joke; Nitta doesn't want to shoot anyone, so Hina uses her powers to clean out a whole building of thugs set to a chorus of "owie" as they land outside. There's also really no fanservice to speak of. Yes, Hina, Anzu and the other girls teleport into the show buck naked, and there's even a scene with Anzu naked in the shower, but you can't call that fanservice any more than you could call the bath scene in Totoro the same.